The rhubarb we brought back from Jamie's parents' garden has made a few appearances in my recipes this past month, adding a wonderful tartness to peach rhubarb pie and to strawberry rhubarb spiced Chai tea bread. And I still have a little rhubarb left in the freezer, so there may be yet another recipe before the summer's over. As I was thinking of a recipe for lemon yogurt waffles, the idea of a berry syrup instead of maple syrup seemed like a nice change for summer. I cooked the rhubarb down with some strawberries, sugar, a little lemon and a cinnamon stick, and after straining the liquid and reducing it further still, the scent of a wonderful, sweet-tart syrup filled the kitchen. 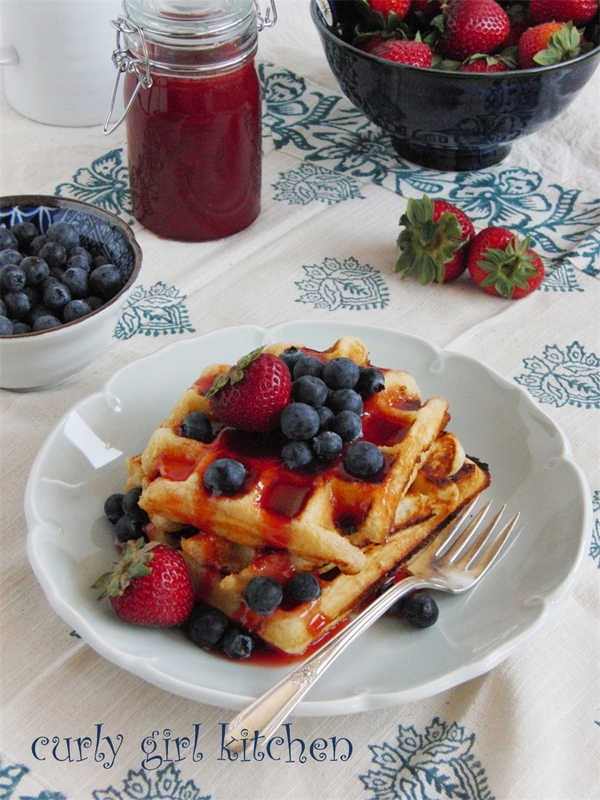 So with homemade syrup in the refrigerator, I decided that last Sunday should be a waffle morning. 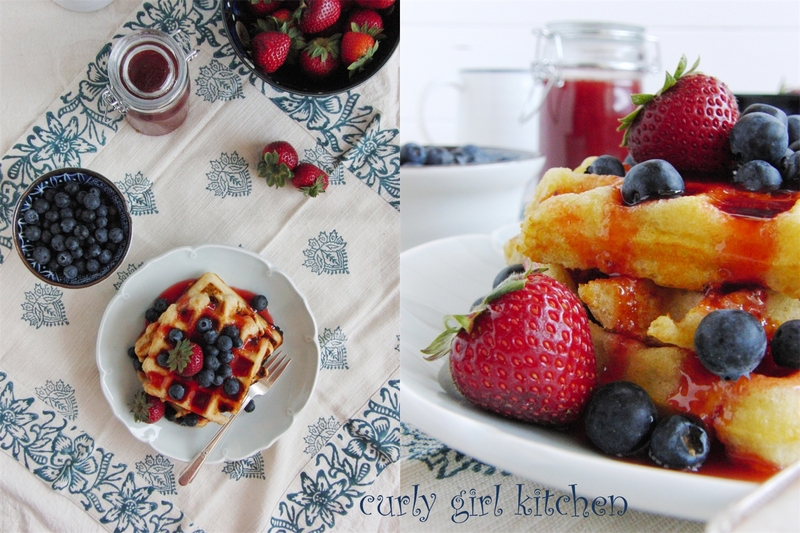 Fresh blueberries and strawberries looked beautiful and tasted fantastic with the lemony waffles and sticky red syrup. You all may have been following the news lately and seen what a fight Colorado has experienced this summer - it's as though the whole state is on fire with so many fires raging all over. A fire earlier this summer was the horrifying result of a controlled burn that hadn't been put out properly, but these recent ones have been caused by lightning storms. A place my parents have taken my brother, sister and I a few times, the Flying W Ranch in Colorado Springs, which features a chuck wagon dinner and cowboy music, has been owned by the Wolfe family since 1953. What began as just a ranch eventually became a popular tourist attraction. Just a few days ago, it burned to the ground in the Waldo Canyon fire, and there have been so many other homes destroyed. When other parts of the country and the world have been ravaged by earthquakes, hurricanes and floods, I've been thankful to live in Colorado since it sometimes feels like we're free of natural disasters except for the occasional tornado. But this summer has been a reminder that nothing is certain and that everything can be taken away in an instant. With a state-wide fire and fireworks ban, this 4th of July won't see as many backyard campfires for s'mores-making or fireworks shooting off in people's driveways, but it's still sure to be a wonderful day of celebrating the nation's freedom. And our freedom is a symbol of hope. In a large bowl, whisk together the flour, sugar, baking powder, baking soda and salt. In a separate bowl, whisk together the egg, yogurt, lemon juice, lemon zest, melted butter and vanilla. Pour the wet ingredients over the dry ingredients and stir until just combined – batter should be very thick and fluffy. Set the batter aside to rest for 20 minutes. Preheat your waffle iron and cook the waffles according to your waffle iron’s instructions. I measured out 1/3 cup dollops of batter to yield 6 waffles. 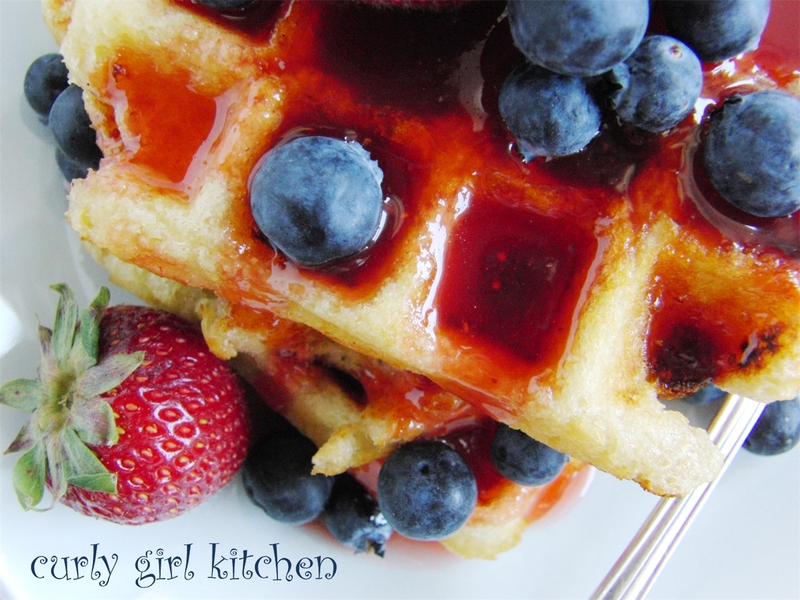 Keep the cooked waffles warm on a baking sheet in a 150-degree oven while you cook the remainder of the batter. In a large stockpot, combine the rhubarb, strawberries, sugar, water, lemon juice and salt. Bring to a boil over medium heat, then reduce to a low simmer for 30 minutes. Puree using a blender or immersion blender. Add the cinnamon stick. Simmer for one hour, stirring occasionally. Pour mixture through a mesh strainer, pushing as much liquid through as you can. Pour the liquid and the cinnamon stick into a clean saucepan and simmer until thick and syrupy, about one more hour. Stir in the vanilla. Cool, then store in glass jars in the refrigerator until ready to use. 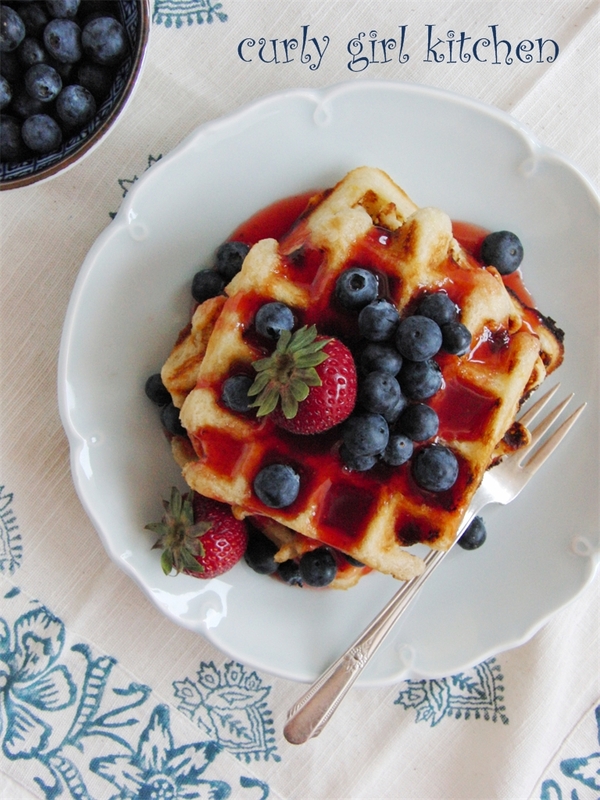 Drizzle over pancakes or waffles, or use to flavor mixed drinks or cocktails. 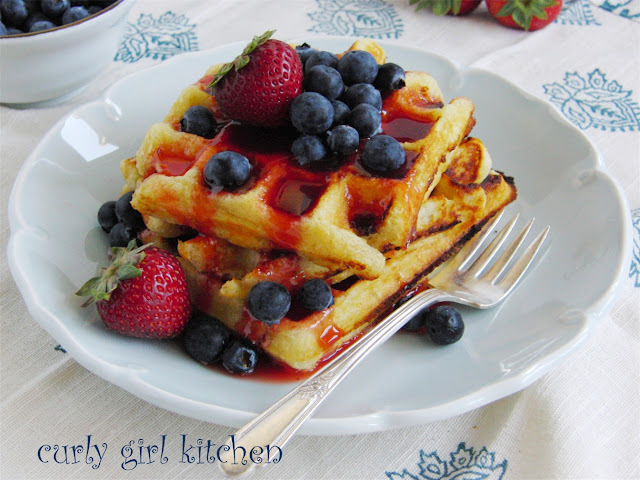 Note: Save the pulpy puree that is left in the strainer – this would be fantastic added to the batter of a loaf bread or muffins in place of applesauce or oil. Yields about 1 1/2 cups of syrup and 1 1/2 cups of puree. Awesome recipe, these turned out delicious! I didn't have any lemons, so I used 3tbsp lemon juice plus a couple drops of lemon oil I had on hand. 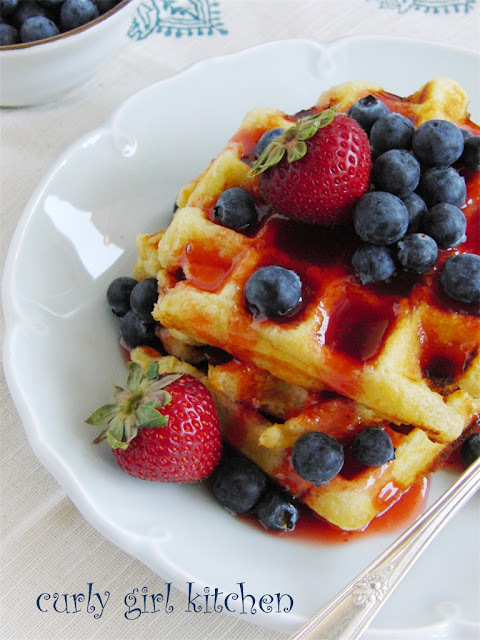 The oil added very strong lemon flavor to the waffles that lemon juice alone won't give (you only need 2-3 drops!). The batter was extremely thick, so I added another 1/2 cup milk to make them more manageable, and they still ended up super fluffy, full of lemon flavor, and delicious.